1982-08-07. New. Ships with Tracking Number! INTERNATIONAL WORLDWIDE Shipping available. Buy with confidence, excellent customer service! Bantam, 1982-03-01. Mass Market Paperback. Used:Good. 2007-02-01. New. Ships with Tracking Number! INTERNATIONAL WORLDWIDE Shipping available. Buy with confidence, excellent customer service! Nelson Doubleday, 1973-01-01. Hardcover. Used:Good. 2011-02-05. New. Ships with Tracking Number! INTERNATIONAL WORLDWIDE Shipping available. Buy with confidence, excellent customer service! 1982-03-01. Good. Ships with Tracking Number! INTERNATIONAL WORLDWIDE Shipping available. May not contain Access Codes or Supplements. May be ex-library. Shipping & Handling by region. Buy with confidence, excellent customer service! Nelson Doubleday. Used - Very Good. Very Good condition. Good dust jacket. With remainder mark. 2008-04-07. Good. Ships with Tracking Number! INTERNATIONAL WORLDWIDE Shipping available. May not contain Access Codes or Supplements. May be ex-library. Shipping & Handling by region. Buy with confidence, excellent customer service! Garden City , N.Y.: Nelson Doubleday, Inc. NF/NF. 1973. Hardcover; 1st Printing. 1st HB edition/1st printing. This book is one of the few titles where the first hardcover printing was published as a book club edition, and it has the required 42 P code at the gutter of page 277. It does not state first edition on the copyright page, but there are no other printings listed for a hardback edition. The book is near fine plus (clean, straight & tight, with just a tiny bit of bumping at the spine ends from shelving). The near fine dust jacket is unclipped, clean, bright & crisp (there are two or three tiny pinholes at the top spine edge and one tiny edge tear, plus some light rubbing to back panel). A hair-raising follow-up to one of the most spectacular movies of the decade --- from dj. ; Book Club Edition; 8.5 x 5.5 inches; 278 pages . Nelson Doubleday. Hardcover. B000NPUCW8 . New. Tor Books. Paperback. 0765317729 Please allow 4 - 14 business days for Standard shipping, within the US. Thank you for supporting our small, family-owned business! . Fine. 2007-04-03. 1. Tor Books. Paperback. 0765317729 Please allow 4 - 14 business days for Standard shipping, within the US. Thank you for supporting our small, family-owned business! . New. 2007-04-03. 1. Bantam Books. MASS MARKET PAPERBACK. 0553144383 New Condition. . New. Tor Books. PAPERBACK. 0765317729 New Condition. . New. 1982-08-07. Good. Ships with Tracking Number! INTERNATIONAL WORLDWIDE Shipping available. May not contain Access Codes or Supplements. May be ex-library. Shipping & Handling by region. Buy with confidence, excellent customer service! 2011-02-05. Good. Ships with Tracking Number! INTERNATIONAL WORLDWIDE Shipping available. May not contain Access Codes or Supplements. May be ex-library. Shipping & Handling by region. Buy with confidence, excellent customer service! Tor Books, 2007. Paperback. New. 8.5 x 5.5 cm. New York: Nelson Doubleday, 1973. First Hardcover Edition 1st Printing. Hardcover. Near Fine/Fine DJ. 278 Pp. Ocher Boards. Near Fine Book, Touch Of Rubbing At Ends Of Spine, In Fine Dj. This Is A Book Club Edition, But Also The First Hardcover Edition Of This Book. Garden City, New York, U.S.A.: Nelson Doubleday, Inc., 1973. Book. Near Fine. Hardcover. Book Club (BCE/BOMC). A square solid tight carefully read copy. This copy has some light soil to the front board and to the edges of the text block. The jacket has some light rubbing wear, light soil, a bump to the bottom edge of the rear panel which has resulted in light wrinkle, two short closed tears. THIS COPY IS IN MY POSSESSION AND WILL NORMALLY SHIP NEXT DAY. This is the first hard cover edition of this novel which was released as a PBO. 42P on page 277. This edition preceded all other hard cover editions. Pretty nice copy..
Tor Books, 2007-04-03. Reprint. Paperback. Used:Good. New York: Tor, 2007. First Printing. Printed wrappers. Advance uncorrected proof. First Tor edition. A fine copy. ; Octavo; 332 pages. Tor Books. PAPERBACK. 0765317729 Like New Condition. . Fine. Bantam Books. MASS MARKET PAPERBACK. 0553144383 Like New Condition. . Fine. Tantor Audio. MP3 CD. 1400155649 *LIKE NEW* Ships Same Day or Next! . Fine. Tantor Audio. MP3 CD. 1400155649 *BRAND NEW* Ships Same Day or Next! . New. New English Library Ltd, 1974. Hardcover. Good/Very Good. 1974. 278 pages. Pictorial green jacket covering green cloth. Pages are slightly yellowed with moderate foxing and creasing included. Binding is firm with bright and clean boards. Spine has very light shelf wear. Unclipped jacket has light creasing and markings to the covers. New York: Nelson Doubleday, NY, 1973. 1st Edition 1st Printing. Hardcover. Near Fine/Very Good. 8vo - over 7¾ - 9¾" tall. David K Stone (Cover). First Edition, first printing of this title that was issued as a Book Club edition, the only U.S.A. hardback edition of this title precedes UK first Hardback edition and is considered to be the True 1st Edition. has the code "42P" on page 277 further defining the 1st Edition, 1st Printing. Book is tight clean and square. Boards sharp and clean, gilt perfect. Minor bump to head and foot of spine, Light spotting to top text block edge, Deckle fore edge. Near fine condition. Jacket couple of minor rubs light toning to spine, and some marks to white rear cover. Overall a solid very good example close to near fine. A uncommon title in the U.K. This copy is not ex-lib, not priced clipped and has no inscriptions. This book is fitted with a non adhesive archival quality book protector to make a quality addition to your collection. Note we do not use stock images, the book pictured is the book described. A nice example of this collectible first edition first printing title, by the author of Dune. 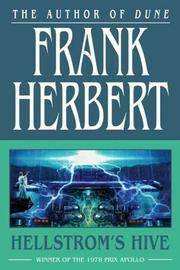 Other scarce Frank Herbert and Dune titles available search for keyword Durddune. Nelson Doubleday. Near Fine in Fine dust jacket. 1973. Hardcover. Octovo hardcover, BCE edition, tight and square spine/binding, pages bright and crisp, the covers are unworn, '87' in red on inside pastedown and prior owner name, would be fine but graded at NFINE in very bright and unworn dustjacket, graded at FINE or FINE+, now preserved by clear mylar wrap. ; 8vo 8" - 9" tall . Tor Books. Paperback. 0765317729 Please allow 4 - 14 business days for Standard shipping, within the US. Thank you for supporting our small, family-owned business! . Fair. 2007-04-03. 1. Tor Books. PAPERBACK. 0765317729 Special order direct from the distributor . New. Findaway World, 2008. Audio Book. Good. preloaded_digital_audio_player. Signed by Author(s). PLAYAWAY. Reliable and Presentable PLAYAWAY EDITION withdrawn from the library collection with some library sticker and marking. Digital audio player already pre-loaded audio book. PLAYAWAY IS EASY TO USE! Just plug in the earphones, press the power button ON and begin to listen and enjoy. This PLAYAWAY comes in the original orange plastic style playaway packaging with original printed artwork inserted. Included is an earphone and new battery. So convenient. Light weight with a powerful purpose. Take along on your next journey! Makes a sensitive get well gift! Enjoy the convenience and versatility for all your travel and leisure needs. .
Tor, 2007. Later Printing. Trade Paperback (i.e. 5-6 by 8-9 inch softcover). Volume condition: New (Condition varies from Fine to Near Fine. Please inquire as to specific condition) / Jacket Condition: N/A (volume is softcover). Gollancz. PAPERBACK. 0575101083 Brand New ,Original Book , Direct from Source , Express 5-8 Business days worldwide Delivery. . New. Garden City, NY: Nelson Doubleday. Very Good in Very Good dust jacket; Owner name on front free endpaper. . Jacket rubbed.. 1973. Book Club Edition. Hardcover. First edition in hardcover, having originally appeared as "Project 40" in Galaxy Magazine. Jacket art by David K. Stone. A sequel to the 1971 movie, The Hellstrom Chronicles, in which the twisted Dr. Hellstrom has created a beehive-like commune full of humanoid insects that look like men but have the weightlifting powers of ants, infra-red eyes of dragonflies, and can reproduce lost appendages like praying mantises. ; 278 pages . Condition: Very Good in Very Good dust jacket; Owner name on front free endpaper. Jacket rubbed. Nelson Doubleday. F/F. 1973. Book Club Edition. Hardcover. No wear, no markings, tight and very clean, interior is as bright and crisp as new. Dustjacket has no wear and the colors are very bright including the white. The code in the gutter is 29 Q rather than the one indicating the first. ; 8vo 8" - 9" tall; 278 pages . London: New English Library 1974 First UK Hardcover Edition 8vo 278pp ISBN 0-450-02137-8, 1974 Near Fine original green cloth, gilt titles & device, slight tanning to page edges, in Near Fine Brodart-protected DW. Wrap-around jacket art by Bruce Pennington. Tor Books. PAPERBACK. 0765317729 Brand New! Not overstocks or remainder copy! . New. Garden City, NY: Nelson Doubleday, Inc., 1973. Hardcover/ DJ; As New/ Near Fine condition. Book club edition. DJ is Near Fine to Fine; bright & clean w/ trace of shelf wear, bit of fray at base of spine panel- otherwise unmarred. NO rubbing, sun or tears. Book is As New. Glossy tan board binding is tight, bright, clean & square- UNmarred. NO bumps, rubs, fray or sun. All green spine lettering crisp & intact. Endpapers & text are tight, bright, clean, unmarked. NO notes, owner names, remainder mark, etc. ; NOT ex library. Handsome, well preserved copy- both DJ & book display extremely well. ***Reliable, fast! (74). Book Club. Hard Cover. As New/Near Fine.